This is the first big holiday weekend of the summer and with it comes a spate of graduation soirees, reunions, picnics, and parties. This means there will be many opportunities to engage in chit-chat. However, finding topics that will not result in a fist fight might be a tad challenging. I have a suggestion. Talk about money. Everyone is interested in money – how it's made, who has it, who doesn't have it, how to get it, and on into the night. Pretty safe. A good way to begin is to ask people what amount they would have to make to be considered rich. Business Insider has already done the calculations for this and determined that being considered rich depends (in large measure) on where you live. They've rated 51 major cities in this regard. Detroit, it turns out, is 51st on the list. If you make $52,498 you're considered rich. Richness in other Midwest cities varies: Milwaukee ($73,602), Indianapolis ($86,202), and Chicago ($100,868). On the other end of the scale at number one is Anchorage, Alaska where you need to make $161,724 to be rich. You probably cannot attain CEO status by Memorial Day, but you can get rich quick in another way. This is a big garage sale weekend, so as you sift through treasures be on the lookout for any document signed by Button Gwinnett. He was the most obscure signee of the Declaration of Independence. The most recent Button Gwinnett signature sold at auction went for $722,500. Some other folks may be anticipating getting rich by betting on sports, thanks to the recent Supreme Court ruling that paves the way for legalized wagering on sports. Michigan is among the states scrambling to implement this. Politicians are salivating at the prospect of taxable revenues and speculate about funding for roads and schools. The number $1 billion has been mentioned. 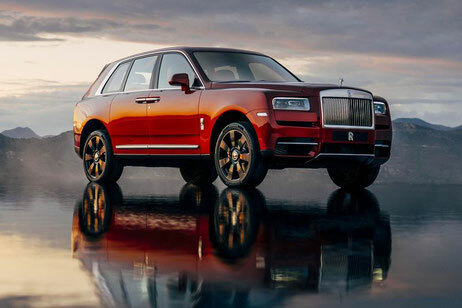 The Cullinan — named for a diamond that's part of the British crown jewels —- weighs 5,864 pounds, has a stainless steel grill, 22-inch wheel rims, and can wade through 21 inches of water. It's powered by a 6.75-liter, twin-turbocharged V-12 (12 cylinders), 563 horsepower engine that can go 155 mph. Decked out with all the extras and accounting for the gas-guzzler tax, you can cruise out of the showroom for a mere $377,250, a pretty good bargain for a rich person like you.